Remember those great vegetables picked from the summer garden back home? Vegetable gardens were a source of pride, but it didn't take much skill to grow a great beefsteak tomato in Pennsylvania. So, can you grow a great beefsteak tomato in your desert yard? If you don’t want to commit a piece of your backyard, you can get started at a community garden near you, such as the Mesa Urban Garden. The Mesa Urban Garden rents 4-foot by 6-foot raised beds for a $40 set-up fee and $120 to plant all year. The downtown Mesa garden, which opened in January 2013, provides soil and compost, water, a timed irrigation system, tools, classes and plenty of experienced people to guide you from seeding to harvests. 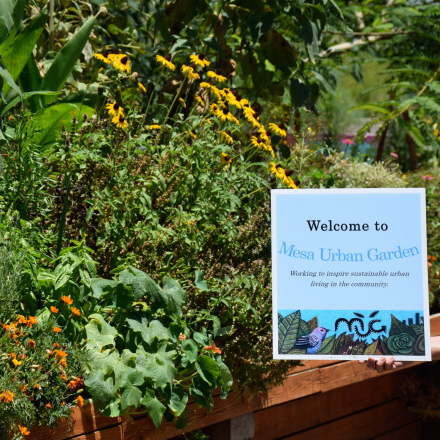 Here are some suggestions for new gardeners offered by the Mesa Urban Garden team. Choose the right variety: Don’t get your heart set on a variety that grew well back home. For example, tomatoes planted in the early spring need to ripen quickly, before the southwest summer heat hits. There are great tasting arid-adapted seed varieties of just about every familiar vegetable. These seeds are developed to grow in desert soils, grow with less water, ripen within the season and even repel garden pests. Ask experienced gardeners or your local nursery for guidance. Raise the bed: It’s not necessary to plant in a confined raised bed, but these beds make it easier to keep grass and weeds out of your garden. Most raised beds are just 6 to 12 inches off the ground and you can create a bed with blocks, bricks, or wood. Volunteers at the Mesa Urban Garden built one of their larger garden beds high enough to be accessible to gardeners who use walkers or wheelchairs. Don’t fret the soil: Desert soil doesn’t need as much help as you think to produce great produce. Starting soil needs to be made up of about a quarter organic-rich soil, such as composted green waste or composted manure. After that, spread a layer of composted organic soil on top of the garden every couple weeks. That's enough to keep the vegetables nourished. The top layer also helps to save water by maintaining moisture in the soil. There’s no need to work it into the ground. Think small: Plants don’t mind a crowd. You can confine each vegetable plant within a square foot. This method creates an intense garden that produces a wider variety of vegetables with less work, less weeding and less water. Timing is everything: Don’t make a move without a reliable planting calendar. The one offered by the University of Arizona Cooperative Extension (pdf) tells a gardener when to plant what vegetable, either seed or transplants, and when to expect to harvest that vegetable. There also is a helpful guide at Urban Farm Low-Desert Planting and Harvest Calendar (pdf). Don’t fear seeds: Use seeds, not transplants, when possible. They are cheaper and tend to mature just as quickly as transplants. If you plant in rows, plant the seeds in the indentations, not on the berms. Depressions in the soil help hold water or rain for the plants. Always read the seed packet for tips. Fear the birds: When growing seedlings, it’s a good idea to cover the area with a light cloth, such as frost cloth. That allows sun and rain to reach the seeds but not the birds. Birds will eat seeds and the seedlings, so keep the plants covered for about two weeks or at least until they are about an inch high. You can use old plastic cutlery to lift the cloth above the seeds after they’ve sprouted. Water can kill: Okra, eggplant, squashes, asparagus, herbs and hot peppers can thrive even in the middle of a desert summer. What no vegetable can survive is over watering. Drip irrigation systems work well for vegetable gardens and keep water at the roots. Don’t water every day for 15 minutes. Soak the area less often to a depth of about 6-12 inches, depending the maturity of the plants. Vegetable plants will droop a little when they need water. During the middle of the summer, never judge the need for water by the condition of your vegetable plants during the middle of the day. All of them will look stressed. Only those that look stressed early in the morning may need watering. Offer a little shade: For summer gardening, vegetables do best if planted with some shade from the western sun. A sheet won’t work. The shade needs to be filtered to let in some sun and rain. A nearby tree or frost cloth works. Some gardeners build arbors where the vines from squashes or gourds can grow up and over, providing just enough shade for all the vegetables. Right now, gardeners are planting winter vegetables such as kale, Swiss chard and other leafy greens. Once mature, you can take off the outer leaves and leave the center, which will continue to produce several harvests of greens. Root crops, such as beets, carrots, turnips and radishes, also do well in desert winters. If you want to grow tomatoes, sweet peppers, beans or herbs all year, remember they are frost sensitive and must be covered.